Growing up, every first Friday of the month my mom and I would go to folk music sing-a-longs with groups of her folk music loving friends. It was always a lot of fun; we sang great tunes by Pete Seeger, Bill Staines, Bob Dylan, the Beatles and much more, accompanied by guitars, drums, and fiddles. As a kid I always thought Pete Seeger embodied what it meant to “be American.” My mom worked with the Madison Folk Music Society, and actually met Pete Seeger a couple of times. 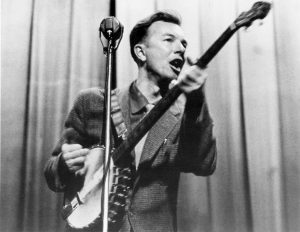 Upon finding this video entitled “Folk singers linked to alleged ‘Communist Conspiracy’” I was shocked to learn that Pete Seeger was accused of being a communist (and didn’t deny it,) mostly because I had heard such negative things about the ideology and such positive things about Pete Seeger from my mom. I was surprised that she never mentioned this to me. This leads me to the video that challenges Pete Seeger’s folk ideals. In 1957 Seeger was cited on ten counts of contempt of Congress after he refused to testify before the House Committee on Un-American Activities (HUAC) in 1955. 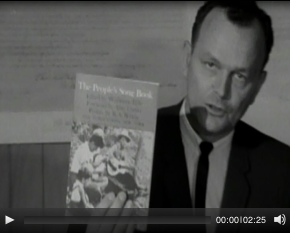 This video shows the original proposal to HUAC that Pete Seeger and his folk music were Un-American. 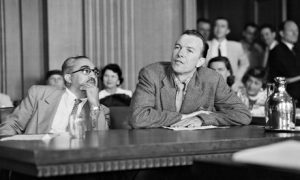 This committee was part of the second Red Scare, which refers to the fear of communism and its destruction of true American politics, culture, and society that spread across the country in the 40s and 50s. This critical opinion of the committee identifies fundamental problems with HUAC – it its pursuit of the “anti-American” it engaged in an essentially anti-American activity. Pete Seeger would certainly agree with this perspective. He refused to testify, as he believed that the questioning of his musical and political endeavors was his own business as an American, and the government had no right interfere. So, how has Pete Seeger remained so “American” after all this time? Can we divorce a person and their art from their politics? Why do we still view communism as so distinctly at odds with Seeger’s message of peace? We often separate his communist ideology with his message of peace, but why can we not see these political views as an integral part of his message. Folk singers linked to alleged ‘Communist Conspiracy’. Popular Culture in Britain and America, 1950-1975. August 19, 1963. http://www.rockandroll.amdigital.co.uk.ezproxy.stolaf.edu/video/videodetails.aspx?documentId=664253&videoSearch=folk. “Notable & Quotable; the New York Sun Recalls Pete Seeger’s Soaring Music–and His Late-in-Life Confession about Failing to Confront Communism.” 2014.Wall Street Journal (Online), Jan 28. https://search.proquest.com/docview/1492135733?accountid=351. “Congress Creates A Frankenstein.” 1953.The Chicago Defender (National Edition) (1921-1967), Nov 21, 2. https://search-proquest-com.ezproxy.stolaf.edu/docview/493013412?accountid=351. Anne Dhu McLucas . “Seeger, Pete R..” Grove Music Online. Oxford Music Online. Oxford University Press, accessed October 15, 2017, http://www.oxfordmusiconline.com/subscriber/article/grove/music/A2259314. Bromberg, Minna and Gary Alan Fine. 2002. “Resurrecting the Red: Pete Seeger and the Purification of Difficult Reputations.” Social Forces 80 (4): 1135-1155. https://search-proquest-com.ezproxy.stolaf.edu/docview/229870616?accountid=351.